» Fantasy Fiesta: When Can We Trust the Numbers? Fantasy Fiesta: When Can We Trust the Numbers? These questions often have easy answers. No, you should not dump Jose Bautista. Yes, you should dump Willie Bloomquist. But the vast majority of major leaguers fall somewhere between Bautista and Bloomquist, and we don’t mean Steve Bedrosian, Sean Berry, and Dante Bichette. To find the answers to those tougher dilemmas, we need to start by asking a very basic question: When can we start trusting the numbers? Rather than make vague declarations about players coming around or regression toward the mean, baseball researcher Russell Carleton (a.k.a. Pizza Cutter in analytical circles) decided to test just about every stat you can imagine. How many plate appearances does it take before we can trust a hitter’s batting average … not to mention his home run rate, walk rate, strikeout rate, on-base percentage, and batting average on balls in play? The resulting post, published in 2007, is well worth the read. OK, let’s dig in. How many plate appearances does it take for various metrics to become a reliable indicator of player performance, immune from dismissive “small sample size” waves from heartless nerds like me? And which players could make worthy fantasy targets (or holds, or sells) based on these numbers? Many everyday players have hit the 150 PA mark, so all of these markers apply to the present. Asdrubal Cabrera stands out as a target player. After posting a breakout season last year with 25 homers, 92 RBIs, and 17 steals, the Indians shortstop has dramatically improved his batting eye this season. His 90.1 percent contact rate ranks 11th among all qualified MLB hitters. That spike in contact rate (career 85.1 percent) has triggered a sharp drop in Cabrera’s strikeout rate, to a career-low 6.3 percent. He’s also putting up the best walk rate of his career, at 11.9 percent. This isn’t a buy-low opportunity per se. But a 26-year-old shortstop coming off a 25-homer season who’s walking nearly twice as often as he’s striking out isn’t just good, it’s bloody fantastic. Cabrera’s .325 batting average stands out, but his counting stats are slightly off this year (other than runs scored). Make a strong offer for him, treating him like he’s the top-10 fantasy shortstop that he is. He might end up top-five very soon. Given some of the names above him (Mike Aviles, J.J. Hardy, Rafael “Mister Glass” Furcal) he might end the year in or near the top five. If it seems like statheads have been swooning over Edwin Encarnacion for years, it’s because we have. A third baseman who hits 26 homers in 146 games at age 25 warrants that kind of enthusiasm. But his career stalled from there, with a combination of horrible defense (he’s not called “E5” for nothing) and low batting averages torpedoing his real-life and fantasy value. This year, Encarnacion has tapped back into his prodigious power, and he’s done it by hitting more fly balls than ever before: He leads the majors in fly ball rate at 55.2 percent, way up from his career 45 percent mark. If you’re a slap-hitting 160-pounder, more fly balls are a problem. For Encarnacion, a power hitter who hadn’t quite put it all together, more fly balls mean more home run opportunities. That makes his 13 bombs look legitimate, with a home-run-to-fly-ball rate that’s at 18.8 percent, also a career-high number, but not outrageously out of line with top sluggers’ marks. There are some weird numbers here too, starting with a 9.4 percent line drive rate that’s the lowest in MLB, putting his batting average at risk. 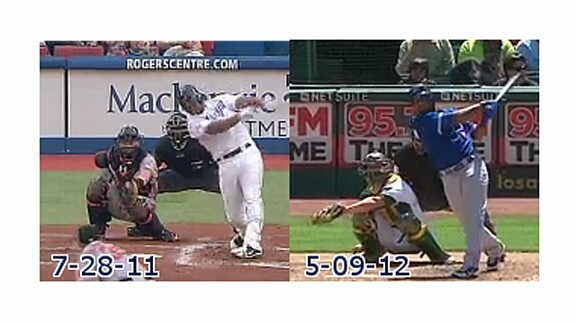 Various reports have Encarnacion changing his swing, going with more of a two-handed follow-through that’s generating more power (hat-tip FanGraphs’ Jack Moore for the screen caps). The closer we get to his fly ball rate reaching the stabilization point, the more confident we can feel that a 30-homer season — maybe even 35 homers or more — might be a real possibility. Fresh off signing a four-year, $35 million contract extension, Erick Aybar has been one of the absolute worst hitters in all of baseball this year, at .190/.215/.238. He’s doing a hell of a lot of things wrong, but few stand out more than his infield pop-up rate: 23.1 percent, more than twice his career number of 11.1 percent. For all that weak contact, though, Aybar is months away from reaching the point where we should believe he’ll pop up that often. Hitting that many pop-ups can destroy everything from a player’s isolated slugging (also known as ISO, which is simply slugging average minus batting average) to batting average on balls in play. Coincidentally, isolated slugging doesn’t typically become peggable until 550 plate appearances, while BABIP doesn’t stabilize even after 650 plate appearances, which is ostensibly a full season. That doesn’t mean all of Aybar’s problems can be traced to more pop-ups. Only that a speedy 28-year-old who typically hits the ball into the ground, hits .270ish, and steals a bunch of bases probably didn’t turn into a pumpkin overnight. Your major league leader in strikeout rate? Gio Gonzalez, with 11.1 punch-outs per 9 innings after 10 in seven frames last night. With 195 batters faced this season, a track record of solid K rates, and a move to the lower-offense National League, it’s not a stretch to see Gonzalez’s whiffy ways continue all year long. Just don’t expect that 2.22 ERA to last all year, and not just because that’s an outrageously low number — he’s allowing a career-high line drive rate of 19.4, yet he’s seen his BABIP plunge to a career-low .243 (vs. .290 career). Oh, and there are the home runs: Pitchers do have some control over limiting the number of home runs they allow, but Gonzalez just yielded his first of the season last night, and sports an HR/FB rate of just 2.6 percent. Good pitcher. This might be the year he evolves into a great pitcher. Not quite ready to call him Bob Gibson. If you can get an elite hitter for him (maybe Gonzalez and a lesser bat for an early slumper like Bautista?) you should jump on that immediately. Let’s start with this: The first seven weeks of the season should offer an object lesson in the dangers of overpaying for hyped rookies and near-rookies. Desmond Jennings and Brett Lawrie garnered high draft positions and big dollars in various drafts and auctions, and both have disappointed to date. But Matt Moore has been a bigger letdown, with just one win and a 5.31 ERA so far this year. Still, there don’t appear to be major underlying problems here; Moore’s healthy by all accounts, and he’s still gunning his fastball at 94-plus. His biggest problem has simply been one of location, alternating between meatballs that are getting hammered and the third-highest walk rate of any qualified starting pitcher. With just 177 batters faced in 2012, Moore needs to triple that number before we can feel more confident that his suddenly sky-high walk rate is for real. That’s not to say you should have to endure three more months of misery if he continues to struggle, especially in shallow non-keeper mixed leagues where you can just stream whoever’s pitching at Petco in a given week. But 39 innings aren’t nearly enough evidence that the man rated a consensus top-three prospect and a strong Rookie of the Year candidate is suddenly a bum. The Rays and their staff have a good track record with pitchers (like this guy), and Moore’s talent didn’t suddenly vanish. There’s a buy-low opportunity here, especially in deeper leagues.